I'm not a really big camper. But I do get out in the wild beyond once in a while. Once a year, for those unfamiliar with the Mormon culture, there is an experience in male bonding known as the "Father and Sons Campout". It's usually held in May, to commemorate the restoration of the priesthood, and there are often some spiritual activities, like a fireside program in the evening, but mostly it's a chance for all of the guys to get out in the woods with their sons. And it gives the ladies a break. Since I'm not a big camper, I took it as a chance to cook, as I said, in the wild. Even though "the wild" in this case, was just a few acres of grove and meadow about fifteen minutes out of town. We weren't exactly "taking our families and fleeing into the wilderness". The ward even rented a few portapotties. Earlier in the day, in preparation, I discussed with Brendon what we should make. 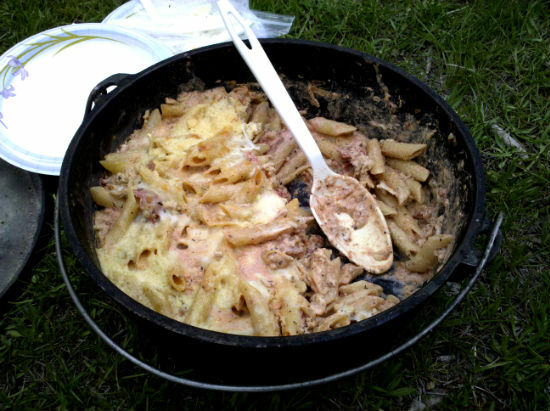 We decided on Brendon's Dutch oven baked ziti, and I thought this would be a perfect opportunity to try making bread while camping. 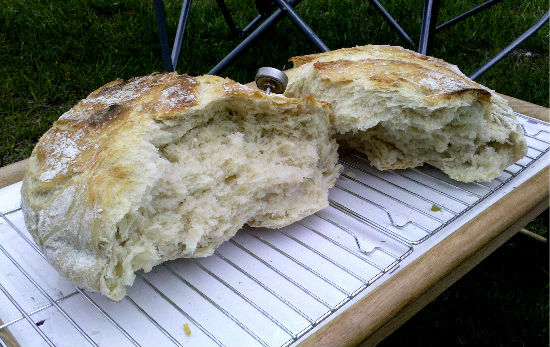 I decided to try the Dutch oven no-knead bread that I had done a few weeks before. That morning, I mixed up the four basic ingredients and set them aside to ferment. It poofed up pretty nicely, even though it didn't have a full overnight rise. Brendon and I also gathered up all of the ingredients for the Ziti. 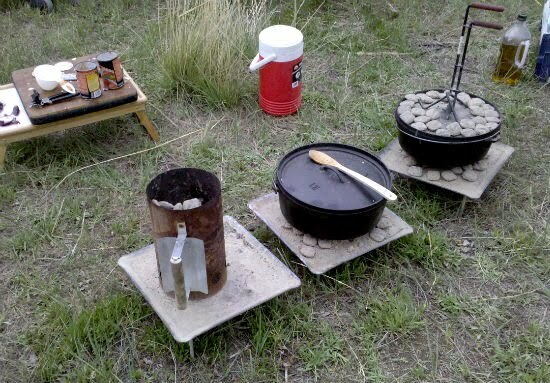 When we got to the campsite, I started setting up the tent right away, and Brendon got some coals started. He also began making the Ziti. Once the tent was done, I got the bread ready. I essentially followed the same procedure I did last time, but I noticed that I had forgotten to bring any parchment paper. I wasn't sure how I was going to transfer the bread dough, all goopy and gloppy, into the dutch oven and not lose a lot of the gas that had built up in the proofing. I also didn't let it rise as long in that proofing stage. Still, it sat for a good 45 minutes or so while I pre-heated the dutch oven to about 400 degrees F.
In the end, I just plopped it from the big plastic bowl directly into the lightly oiled dutch oven. It worked out just fine. This could have easily been one of the best loaves I've baked. It was light and the crust was soft and browned. It really turned out well. In the meantime, Brendon was doing the baked ziti, and it was working nicely as well. I did little with it except to stir it once in a while and give him advice, whether he'd asked for it or not. That's the "Father" part of the "Father and Son" experience. When it was all done, we shared it with our camping neighbors from the ward, and all of them were quite impressed that it tasted so good. I always like that part.